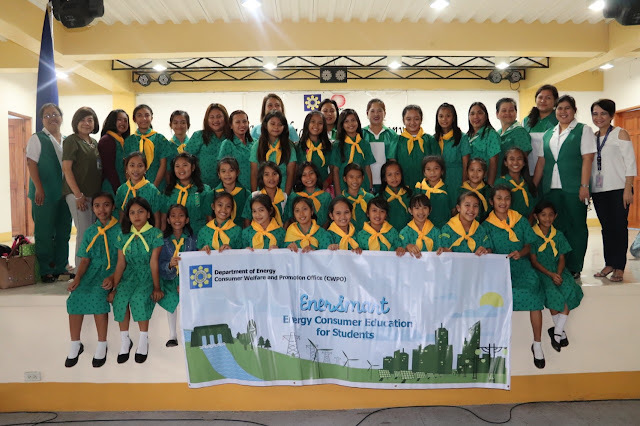 The Department of Energy – Consumer and Welfare Promotion Office (DOE-CWPO) in partnership with the Girl Scouts of the Philippines (GSP) conducted an Energy Consumer Education for Students, known as “EnerSmart” on Tuesday (19 March) at the DOE Training Room. Around 30 Grade 5 EnerKids from the different GSP Councils of Lipa City, Batangas, and Pangasinan attended the lecture to appreciate the value of energy in their everyday lives. Students were shown various rock samples to illustrate the process of energy resource development. Thereafter, they had the opportunity to visit and explore the lighting and appliance testing, geoscientific research and fuel testing laboratories. The activity was concluded with the EnerKids’ Pledge of commitment to adopt energy efficiency and conservation measures. Energy Secretary Alfonso G. Cusi places the EnerSmart program as an important activity of the DOE in order to increase the awareness of younger generation Filipinos on the importance of energy in their lives. “We want our children to participate in public debates on national energy programs and policies,” Sec. Cusi stated. “Our strategic partnership with the Girl Scouts of the Philippines will accelerate the awareness and will further empower the country's young women and children on energy matters,” Sec. Cusi concluded.